Why go to a Bureau de Change? We are a currency exchange that buys and sells foreign currencies, and/or US$ Bank draft to exchange to Canadian dollars and vice versa. We also offer wire payment services, bank to bank only. Certain restrictions apply. We offer a competitive rates, rapid service that we feel is better than most financial institutions. We do not charge any commission or service charges, except for the minimal wire payment fee. Each client benefits from our personalized services which includes both personal and corporate clientele. Why Buy Your Currency at a Bureau de Change? The majority of clients realize that it is better to arrive in a foreign country already prepared, rather than searching for an unknown place to obtain local currency. Here you are assured of a correct rate as well as having the local currency on hand. Is it better to buy your Currency in Canada or in the country of your destination? There are two different reasons to buy your currency here in Canada. Universal Currency Exchange personnel have the knowledge and experience of knowing what each client needs in a foreign country. We can communicate with you in numerous languages aside from English and French, our staff can speak Portguese, Yiddish, Spanish, and Italian. When you purchase your currency at our office, you are assured of legal tender and not obsolete or outmoded bills. In some rare instances, we have been told that unsuspecting clientele have purchased currencies that are invalid and are dismayed to have found out that they have been a victim of fraud by a dishonest party abroad. Our price is the net price, there are no hidden calculations in our receipt - It is simple math. As well, when you arrive in a foreign country, without having prior knowledge of the language, it can be difficult to understand the transaction at hand. For more information, on exchanging currencies, purchasing cheques/wire payments, visit our office located on the Ruelle des Fortifications in the Centre de Commerce Mondial. Why does one have to provide personal information? 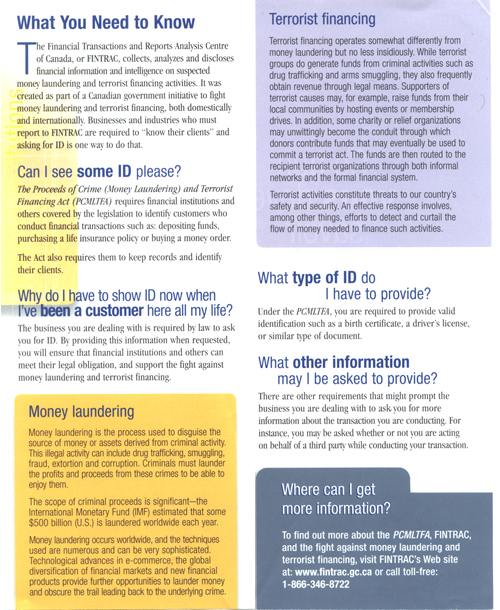 Please visit the web site: www.fintrac.gc.ca Please see the attached brochure - What you need to know....The financial transactions and Reports Analysis Center of Canada..... Please help us to protect our Country and to respect the laws set forth under the Law against Money Laundering and Terrorist Financing.